Having a child with allergies and celebrating all the birthdays that come upon us is not an easy task, since he can not eat most baked goods at birthday parties due to food allergies. I created a simple diy sheet cake so that he too can enjoy the celebrations. Getting creative in the kitchen is part of what I do to keep everyone at the party happy and feeling like they are part of the party and not an alienated force because of particular foods. We are headed off to a party for my parents and their birthdays which are very close together so it is time to celebrate and eat cake! The lavish sheet cakes that are available in most retailers have so many ingredients that people with food allergies can’t consume that it is a MUST to make a birthday cake rather than buy one. 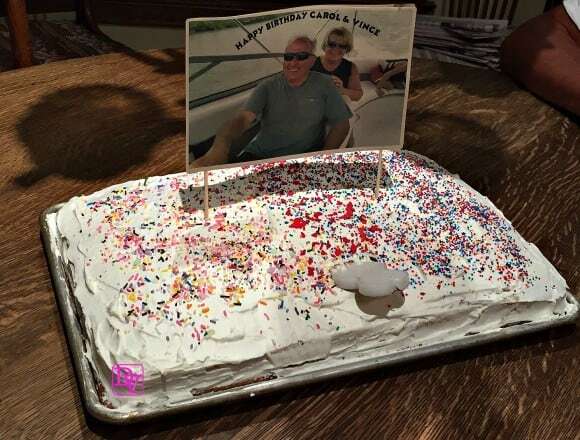 Today’s Simple DIY Sheet Cake is not about being the best looking cake on the block rather it is about creating a cake that everyone can enjoy because it could be consumed by each family member. 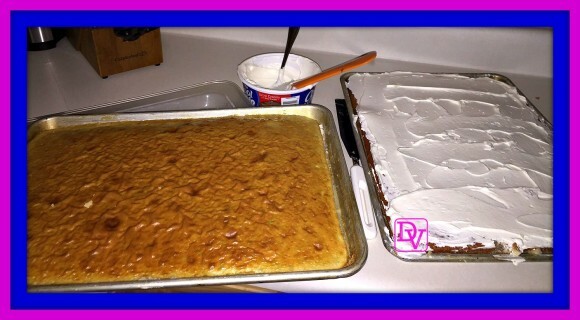 The simply DIY Sheet Cake is lavish because of its size, and how easy it is to create. 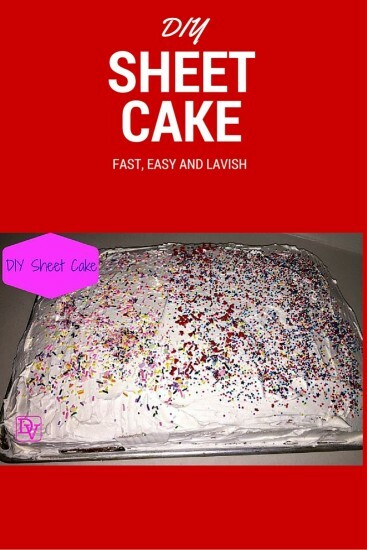 Lavishly live food out loud and learn to create a Simple DIY Sheet Cake! I am not one of those high-end baking mavens(I’d rather be shopping, lol), but I bake because my son can’t eat most food, so if you are looking for the tutorial on how to create an elegant sheet cake… wrong blog! My lavishness is the luxury found in my child with severe food allergies to actually be part of the party and dine on some cake with the rest of us. The ingredients and items you use can greatly change the look and the feel of the cake, I was just looking to lavishly live the basic sheet cake design and get a little creative so we could all dine on fun, festive cake. I have created a wonderful sheet cake with all the touches of baked from scratch, yet keeping it oh so simple. For each 12 x 17 Baking Sheet you will need to mix up two cake mixes to fill pan, your total batches will be 2 using 4 boxes of cake mix total. Follow the ingredients on the box to create each. Bake each cake according to appropriate baking temperature and allow to cool. Decided Which cake is staying in the pan and which cake is going to be the top layer. For the TOP LAYER Cake use the Stainless Steel Spatula(Cake Lifter) to make certain that the cake will ALL lift from the pan. 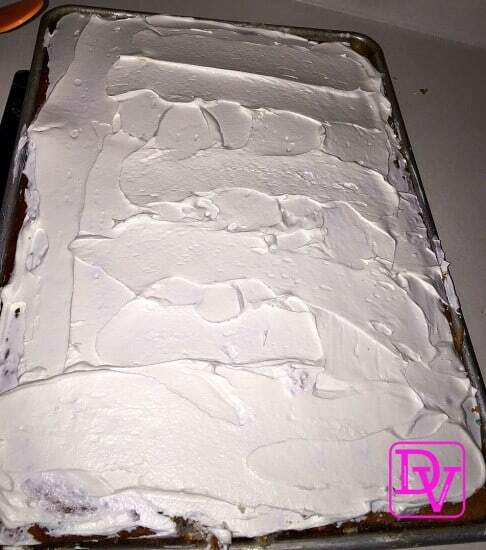 Work your way all around the cake before attempting to remove from the pan and layer. 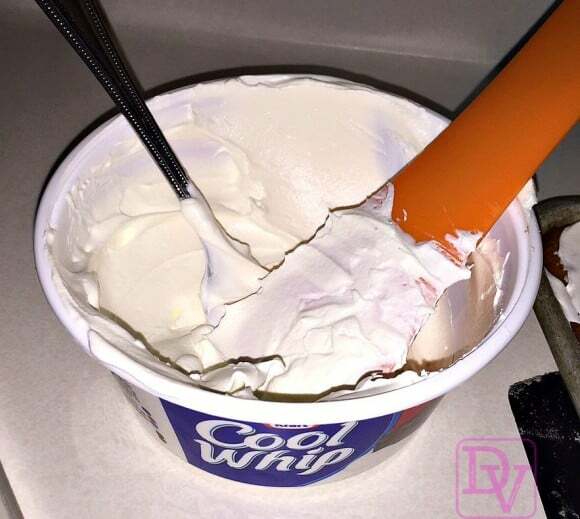 Ice the First layer with 1 Tub of Cool Whip. 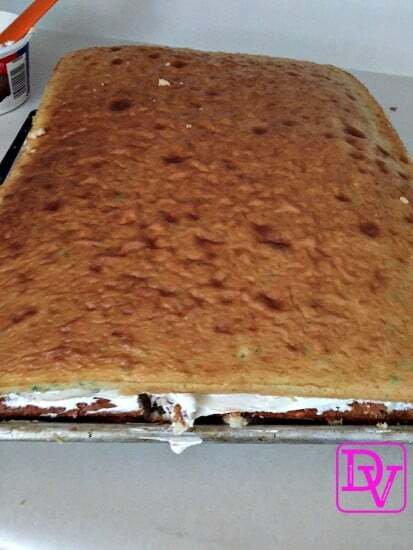 Slide the 2nd cake out of its pan onto the 1st Layer, make sure the edges meet and ice with the 2nd container of Cool Whip. 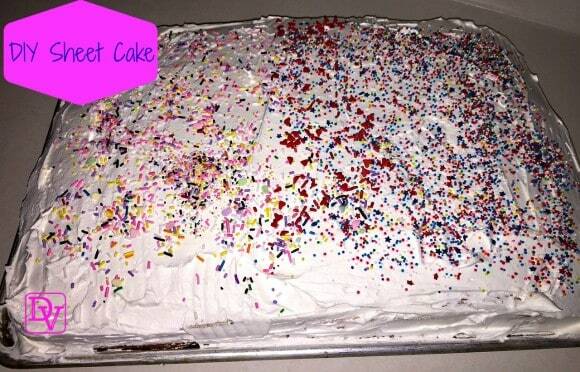 Add Sprinkles or writing to the top of the cake. Use the Spoon to add icing to any area that did not get coated. 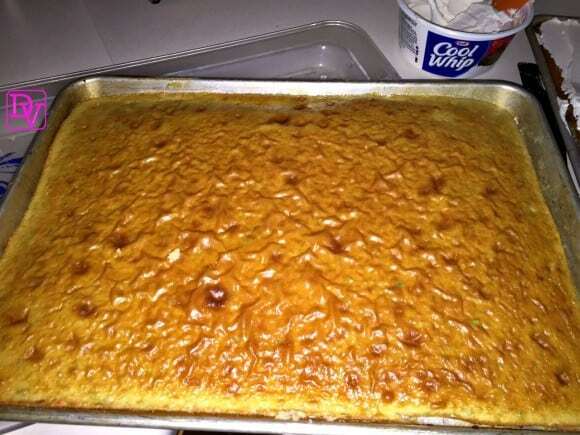 Wipe the sides of the tray off so they are free of icing, and you are good to go! I highly recommend baking the cake the day ahead and allowing it to cool, making lifting so much easier. 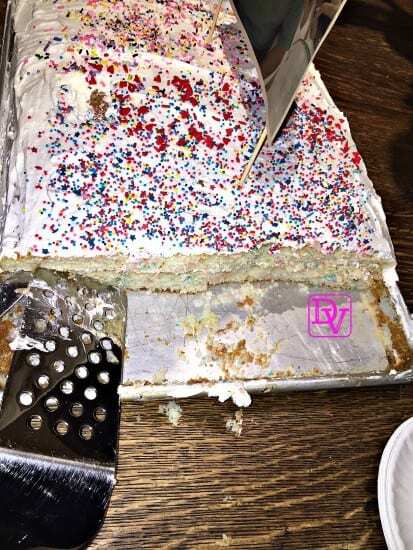 In addition, the cake lifter is such an important tool as it separate the cake from the pan because it is very flexible making it possible to NOT Have crumbled Cake. The Cake Lifter works well to ice the cake evenly if you have purchased a thin, spatula-like one, not the large ones. The different possibilities on this cake are endless and you can take it from the very Simple DIY Sheet Cake that I created in a pinched amount of time, to a very elaborate sheet cake by simply tweaking the supplies you create the sheet cake with. Fondant Icing makes homemade look lavish, try it if you have the patience and time to create! For my next step, I created a home made banner for the cake, which I will teach you in my next tutorial of how to make a simple birthday banner that celebrates the person of the day! The banners are easy to make! For now, this is how to lavishly create a Simple DIY Sheet Cake that everyone in your family can enjoy.